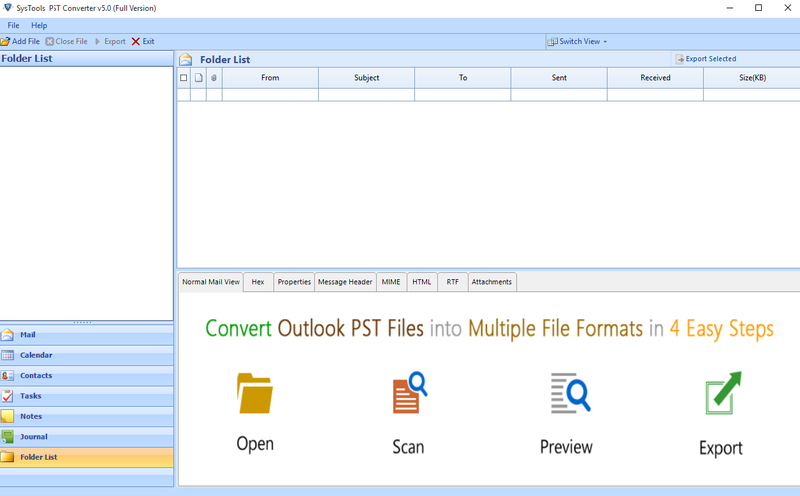 Advanced PST to MSG Converter Tool instantly export PST file to MSG from single & Multiple Outlook PST emails or messages alongwith Attachments. 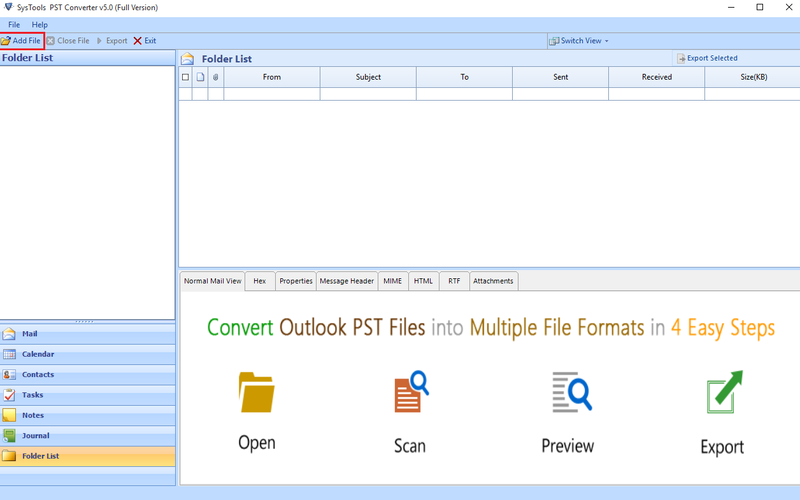 Download Free Trial version of Outlook PST to MSG Conversion software to extract MSG files from PST File (Password Protected, Corrupted & Archive PST) which is 100% Secure & Safe. 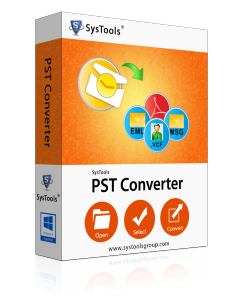 Outlook PST to MSG Converter Tool by SysTools precisely convert PST file to MSG in both Single & Multiple Conversion Mode (by adding PST one after another). Along with emails, it migrate other Outlook data items like : Tasks, Contacts, Calendars from PST into .msg files in batch. This PST Files into MSG Exporter supports both Password Protected & Corrupted & Archive PST to export messages from PST Files to MSG. 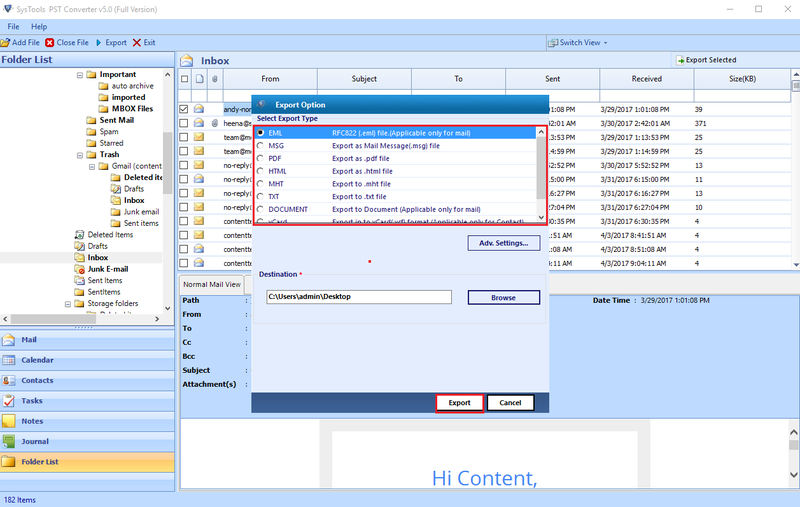 This enables users to retrieve data in healthy MSG format without any alteration in MSG File header & body information when Exporting Outlook Emails to MSG files from PST. Along with emails , the software provides support to preview & then convert PST emails with attachments before exporting them into MSG file. The enables users to verify the complete PST to MSG conversion. The software supports to extract attachments from all Outlook folders such as : Inbox, Drafts, Sent Items, Outbox, Deleted Items etc. Additionally, it supports both ANSI & UNICODE PST into .msg files. This browsing option within File mode facilities those users and administrators who need to directly convert PST file stored on Network into single MSG files. For this, you need to Select the File Mode and in address bar type in your server location and access PST Files within PST to MSG Converter Tool. Software has provided an inbuilt advanced Grid Line search facility that is capable to search within Attributes like : From, To, Subject, Sent, Received & Size. This save users effort to manually browse through every single mail & Exporting Outlook Emails to MSG files from PST. All you need is to search specific email & select them to save as Outlook emails as .msg extension. 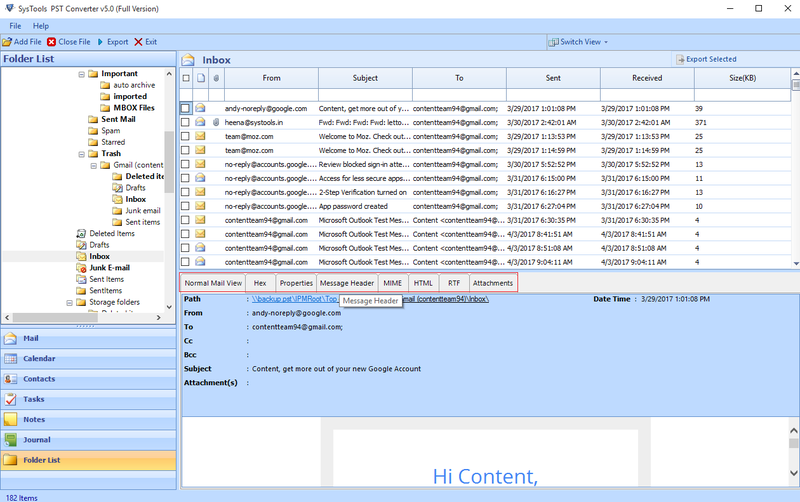 This feature within Outlook PST to MSG converter tool provides ease of access to users enabling them to extract and save emails as per pre-defined MSG Naming sequence like Subject+Date, From+Subject+Date, Autoincrement etc. With Checkbox option provided within the interface, users can selectively choose emails from PST or Outlook folders and convert into MSG. This additional feature has been provided to exclude all the unwanted emails and convert only emails which are required at user end. This PST to MSG Exporter does not require any additional requirement of installing Outlook Environment on user system. You can freely and independently convert PST file to msg in bulk. CSV Reporting being extremely important to many business needs in order to understand the number of emails being converted, failed count. This software has been built with business insight for users who need to export large sized PST into MSG and get reports for each migration being performed. Trial version of Outlook PST to MSG Converter software will preview all the PST items & Export 25 items per folder into MSG. How Can I Convert Outlook 2016 PST file to MSG file of Outlook 2013? Yes, this Outlook PST to MSG Converter can easily convert .pst file to .msg from any to any Outlook versions. Is it Possible to Export Outlook emails to MSG files of a particular month? Yes, definitely you can convert PST emails to MSG for particular month using Date Filter feature. Using this option you can specify ‘From’ & ‘To’ option to specify date that you need to filter & export PST file to MSG Format. How Can I Extract PST Files to MSG which is easily Searchable? Yes, Our PST to MSG Converter provides Naming Convention feature that will enable users to Extract PST Files to MSG using different Naming Sequence like : Subject, Subject+Date, Date+Subject, From+Date+Subject, Date+From+Subject, AutoIncrement & many more. Can I Convert Network PST to MSG Format? Yes, you can easily browse PST File stored on Network using the File Mode. Then, within Address bar type Network Path, where your PST files are located. This will easily convert PST file to MSG. In addition, the software first previews all the Outlook emails before PST to MSG Conversion. Does the tool Convert PST emails attachments into MSG? Thanks for such a simple software. I truly admired the way that in 4 simple clicks i got my destination file in MSG Files. It was way too inconvenient for me export messages from PST files to MSG in mass amount that I had saved earlier into my hard drive without Outlook Installation. Extremely satisfied with working of the PST to MSG converter software. I could preview them and conveniently export PST file to MSG.